As I was recently watching the new Persona 3 movie , I remembered that before Persona 4, there was already a sequel to the hit PS2 game Persona 3 in the form of the anime Persona: Trinity Soul. However, only hearing negative things about it for years, I wondered if it was as bad as I had been led to believe. It isn't. Rather, it is an excellent Persona story with memorable characters. It does have its problems, though. The strongest aspect of Trinity Soul is its cast—especially its main character. In Persona 3 and 4, the main characters are largely blank slates with little in the way of personality or backstory. Of course, this is to let you, the player, have free reign over how they act over the course of the game. In other words, the leads have few defined character traits of their own because they are simply a proxy for the player. As an anime, not a game, Trinity Soul doesn't have this limitation in its main character; and the series is all the better for it. Shin, the protagonist, is a broken character from the start. His parents are dead as is his little sister. He hasn't even talked to his distant older brother in a decade and, aside from a recently deceased aunt, he's grown up with no family but his little brother. Moreover, he is haunted by dreams of a monster coming out of his head to fight other monsters—dreams which turn out to be prophetic. How he deals with his persona-filled situation is always intriguing to watch. And beyond that, the relationship between his two brothers and him forms the emotional core of the series. Aside from Shin, his older brother, Ryo, and younger brother, Jun, fill out the family side of the drama. Ryo is the chief of police at the local station and is secretly working persona-related crimes on the side. Jun, on the other hand, while normal at first glance, occasionally slips into the role of his long dead twin sister—and seems to be able to read people's minds as well. The school-side of the cast is just as interesting. Takuro is a semi-delinquent from a broken home—but is also driven to be a strong, dependable man in the eyes of his friends. Megumi is a normal girl but with a combined fear/hatred of personas and the events that surround them. Kanaru is an innocent girl who has become addicted to a drug-like, persona-related game that is popular among teens. And lastly, Mayuri is a reserved, semi-emotionless girl who transfers into the school just as a series of strange events rock the school. Each of these characters is amazingly well-developed over the course of the series. They all have their own unique backgrounds, secrets, and problems they have to overcome to step up as heroes and save their city. The plot of the series revolves around our persona-wielding student heroes getting involved in a series of murders. The murders are caused by a rival group of younger persona users who have figured out how to rip out and absorb other people's personas—making them stronger while leaving their victims as mutilated husks. When Trinity Soul is focused on our heroes or their battle against these villains, the plot is as good as anything in the games with its countless twists and mysteries to be solved. Unfortunately, that's not all there is to the story. A sizable part of Trinity Soul's plot doesn't really feel like a “Persona” story. The Persona games have certain underlying settings and themes that they have in common with one another: They are about a group of teens with personal problems, dealing with an otherworldly menace that only they—with their personas—are capable of handling. However, the majority of the first half of the anime focuses not on the students but on the eldest brother working his case to stop the villains. Watching a 28-year-old with a persona fight the bad guys while the main character does next to nothing (and the other characters go ignored for entire episodes) is almost anti-Persona in its execution. While Ryo and his development are necessary to the emotional heart of the anime, entire swaths of his story—especially those parts following the cops’ investigation of him or Ryo’s countless brooding scenes and cryptic phone calls—could have been cut in favor of exploring the student cast. In truth, the whole series would have probably been better off if Ryo had never been a viewpoint character at all—adding mystery to both his actions and the extent of his knowledge. 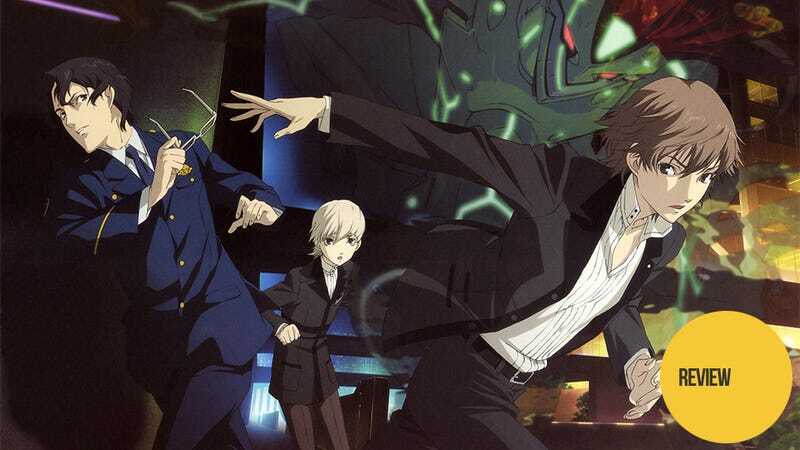 Luckily, once the series hits its halfway point, it stops trying to awkwardly balance the detective and school sides of the story and instead focuses fully on our young heroes—thus making the second half nothing but fun Persona goodness. While the animation of Trinity Soul is generally of high quality, there is a fatal flaw in the animation design which greatly handicaps the series as a whole: the design of the personas themselves. Unlike in Persona 4: The Animation or the Persona 3 movies, the personas in Trinity Soul are semi-transparent. Given how dark the color palette is for the series (with most of the battles taking place at night) this problem becomes quite pronounced: It's difficult to see what's going on. Often, the personas blur together in fights and as we can never see them clearly, it’s often hard to tell them apart. And on top of all that, it looks like some of them might actually have really cool-looking designs; so it's even more of a shame we are never in a position to appreciate them. Without going into specifics, there is a major character crossover between Persona 3 and Trinity Soul. And while the character is a welcome addition—as is any knowledge about the fates of our Persona 3 heroes—and said character transitions into the mentor role quite nicely, the crossover also serves to undermine several of the plot's major dilemmas. Simply put, when you have Mitsuru Kirijo—head of a multi-billion dollar company that has everything from extensive persona research to battle-androids—on speed dial, not calling her in to solve about half your problems in a heartbeat seems like contrived stupidity. The only reason to not call her in is because the writer didn't want her involved with the story—not for any in-universe rationale on the part of the crossover character. As the last episode unfolded and the final plan of the bad guy was revealed, I encountered an interesting problem: The plan sounded like a good idea to me. When it all comes down to it in the end, Ryo, Jun, and the mysterious girl Ayane decide to combine their powers to implement Ryo’s plan of making a world without personas—or perhaps even to remake reality so that there had never been personas in the first place. As the entirety of the problems in their lives had been caused by personas—or at the very least by people's desire to control and exploit personas—the trio creating a world without them would indeed prevent similar disasters from happening again. While there are no doubt reasons to reject this plan, Shin offers none and instead just fights his brother to stop his plan from coming to fruition—just because. Eventually, his brother decides, for no explained reason, to sabotage his own plan at the moment of its success. With that, the series ends in a flash of confusion. Because nothing surrounding the final climax or the motivations of the characters is ever adequately explained, this climax falls completely flat and ends the generally enjoyable series on a disappointingly sour note. In the end, I was surprised at just how much I enjoyed Persona: Trinity Soul. While it was indeed too focused on the elder brother’s police story in the first half, every moment with the student cast both in that part and overall made the anime worth watching. They are amazingly interesting Persona characters—especially Shin, Jun, and Kanaru once secrets start getting revealed. If you love Persona and have somehow missed out on this series, take my word for it: It is worth a watch for any fan. Persona: Trinity Soul is available with English subtitles on DVD in North America. It originally aired on Japanese TV in 2008. An interquel, Persona Q: Shadow of the Labyrinth, was released in Japan for the Nintendo 3DS on June 5, 2014. It is currently set to release in North America sometime this fall.